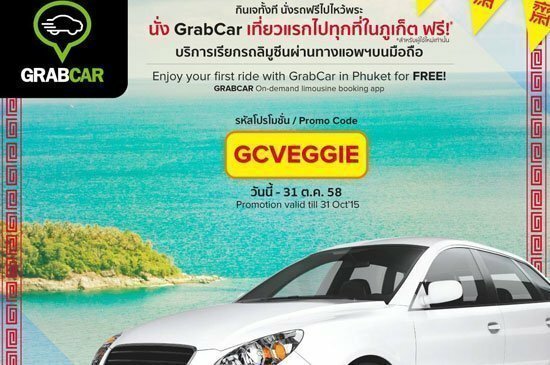 GrabCar: On-demand limo booking app is giving free rides to celebrate Vegetarian festival! GrabCar is the on-demand limousine booking service powered by GrabTaxi, the largest taxi-booking application in Southeast Asia with presence in 26 cities and 6 countries. We provide the safest and fastest rides in Phuket to make sure that your time in Phuket is awesome. Convenience: Our drivers will pick you up right from your doorsteps. No need to hail taxis from the streets or visit limo parking spots. To help kick off the vegetarian festival, we are giving new users their first ride for free! What a great way to enjoy the sights and sounds of Phuket’s colourful Vegetarian Festival!